Welcome to CoChamber.com, an interactive online service operated by The Colorado Chamber of Commerce and Industry (The Colorado Chamber). By using this site, you signify your agreement to all terms, conditions, and notices contained or referenced herein (“Terms and Conditions of Use”). If you do not agree to these Terms and Conditions of Use, please do not use this site. The Colorado Chamber reserves the right, in its sole discretion, to modify, alter or otherwise update these Terms and Conditions of Use at any time. By using this site after notice of such changes is posted, you agree to be bound by the modifications, alterations or updates. The CoChamber.com site contains copyrighted material, trademarks and other proprietary information including, text, software, photos, video, graphics, music and sound. All content included on this site, such as text, software, photos, video, graphics, music, sound, and logos, is protected by copyrights, trademarks, and other rights, which are owned and/or controlled by The Colorado Chamber or by other parties. The Colorado Chamber owns a copyright in the selection, coordination arrangement and enhancement of such content, as well as the content original to it. Each third-party content provider owns the copyright in content original to it. You may use material from this site only for your own personal, non-commercial use. This site or any portion of this site may not be modified, published, reproduced, duplicated, copied, uploaded, downloaded, posted, transmitted, sold, or otherwise exploited for any commercial purpose that is not expressly permitted by The Colorado Chamber. In the event of any permitted copying, redistribution, or publication of copyrighted material, no changes in or deletion of author attribution, trademark legend or copyright notice shall be made. You acknowledge that you do not acquire any ownership rights by downloading copyrighted material. This site may contain links to other sites on the Internet (“Linked Sites”). The Colorado Chamber is not responsible for the content, advertising, products or other materials made available on or through any Linked Site. The links to these sites are for your convenience only, and you access them at your own risk. The Colorado Chamber shall not be held responsible or liable, directly or indirectly, for any loss or damage caused or alleged to have been caused to a user in connection with such Linked Sites. The Colorado Chamber welcomes links to this site. You may establish a link to this site, provided that the link does not state or imply any sponsorship or endorsement of your site by The Colorado Chamber or any group or individual affiliated with The Colorado Chamber.. You may not use on your site any logos, trademarks, service marks, or copyrighted materials appearing on this site, including but not limited to any logos or characters, without the express written consent of the owner of the mark or right. You may not frame or otherwise incorporate into another site the content or other materials on this site without prior written consent. The Colorado Chamber IS NOT RESPONSIBLE, EITHER DIRECTLY OR INDIRECTLY, FOR THE PERFORMANCE OF PRODUCTS AND SERVICES PROVIDED BY ITS MEMBER BUSINESSES. The Colorado Chamber WILL NOT BE LIABLE FOR ANY DAMAGES OF ANY KIND ARISING FROM THE USE OF, OR INABILITY TO USE, THIS SITE, INCLUDING, BUT NOT LIMITED TO DIRECT, INDIRECT, INCIDENTAL, PUNITIVE, AND CONSEQUENTIAL DAMAGES. You agree to indemnify The Colorado Chamber and its officers, directors, employees, agents, distributors, and affiliates from and against any and all third party claims, demands, liabilities, costs, or expenses, including reasonable attorneys’ fees, that arise from your use or misuse of this site. This site is created, operated and controlled by The Colorado Chamber from its offices within the State of Colorado, U.S.A. 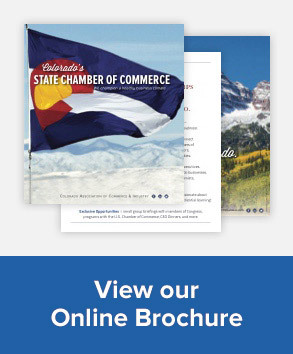 The Colorado Chamber makes no representation that material on CoChamber.com is appropriate or available for use in other locations.